Tiger Woods’ World Challenge plays its final rounds at Sherwood Country Club this week, making this possibly the public’s last view for quite some time of a remarkable private golf venue. Besides seeing how the pros play No. 18, a tight downhill par-4 to a heavily sloped green fronted by a pond, I’m curious to see how the sixth hole represents on TV. No. 15 is an incredible par-3 and the course’s signature hole, designed by Jack Nicklaus. Before adding my two cents, here’s the description you get of No. 15 from Sherwood’s web site. 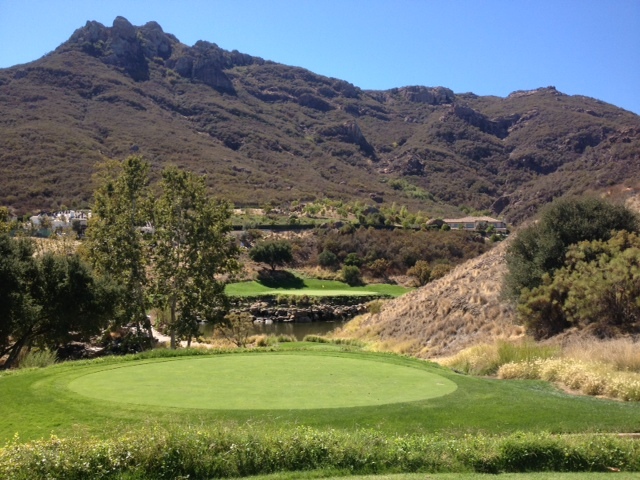 The 189-yard par-3 is the signature hole of Sherwood Country Club. You are greeted by a spectacular view over seven pools and 14 waterfalls with beautiful mountains set as the backdrop. The tee shot is all carry over the water to a green that is only 21 paces deep, so make sure you have the right club, or par will become unattainable. 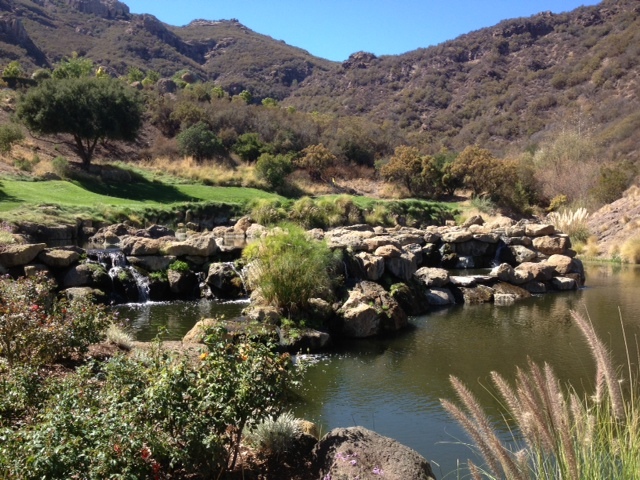 It’s a stunning amphitheater for a golf hole, one you just want to bask in during your round. The mountain backdrop is absolutely huge and is part of what makes this hole so awe-inspiring. And the water features are some of the most intricate I’ve been around. Taken together, it should make for great TV, or a destination hole for you if you’re making the trek to Sherwood. The day I played it, thanks to being probably clubbed by my caddie, I had no trouble hitting the green. The putt, however, was another matter. It was as touchy as any on the course. The green tilts back-to-front and has subtle undulations I underestimated the first time. Curious to see how the pros do. You can find descriptions for the rest of the holes under the country club tab at www.sherwoodcountryclub.com. Looks like the weather should be better than last year for the weekend and will hopefully make for a memorable sendoff. If you tune in, look for No. 15 and enjoy a last televised glimpse at a truly great golf hole. This entry was tagged Jack Nicklaus, par-3, Sherwood Country Club, Tiger Woods, World Challenge. Bookmark the permalink.